Hundreds of miles loom ahead for a family road trip, as does the potential boredom factor. While it’s tempting to let kids watch movies or play games on devices, adults can help navigate toward conversation and chances children actually will look up at scenic vistas. 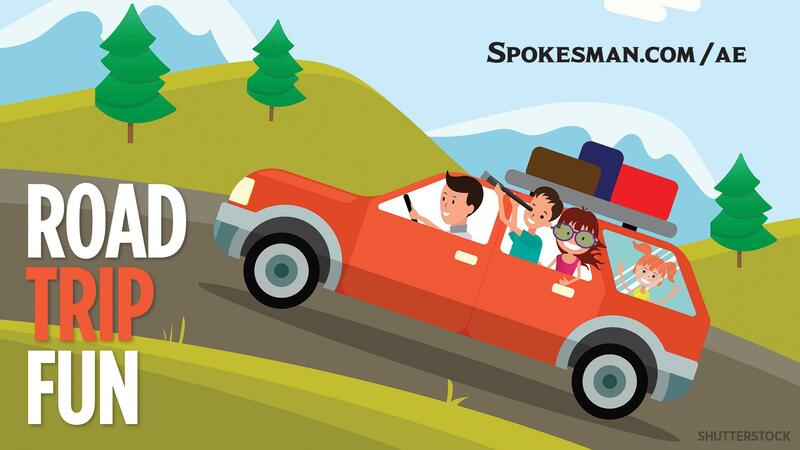 Playing interactive road trip games is one way, said Jennifer Cook, AAA Washington spokeswoman. But you can pack in several other ideas as well. “Before the trip, have your children help plan the route you’re going to take and things to see along the way,” Cook said. “This can be done on their devices or on an old-fashioned paper map. Cook often creates an activity book with a few fun activities for a child based on what family members will likely encounter on each day of travel. She has taken her niece, now 14, on a road trip annually since she was about 7 or 8. “Each day, you give them an envelope that has new pages for their notebook. The notebook has in it the license plate game to check each state as you see them, and plant or animal searches,” she said. Activities can be fill-in-the-blank questions, searches and educational sheets. Cook said adults can search online for the National Park Service’s Junior Ranger Guide. Depending on a park, the agency often has kid activities that can be printed. Sometimes, Cook made up her own activity pages based on website descriptions, around destinations that she and her niece would likely see. She might print a photograph of a famous landmark that her niece would search to find during the trip to match it. Katie Wallace of Coeur d’Alene operates a family lifestyle website Create. Play. Travel.. She and her family recently went on a 4,000-mile road trip to three different states with kids ages 6, 3 and 2. Kids of all ages enjoy finding hidden objects in the pages of a book. You can stock up on all sorts of discovery books, from classic I-Spy books to books filled with creative scenes made from ordinary yet unexpected items. Search and find books encourage kids’ love for reading and discovering new things, even if they can’t read yet. Wallace’s kids enjoy dress-up dolls with magnetic outfits and interchangeable scenes with vinyl sticker books. Coloring books with colored pencils are another low-mess car activity. Small dolls, vehicles or airplanes are fun to play with in the car and encourage kids to use their imaginations. The whole family can play the classic ABC license plate game and compete to find all the letters of the alphabet in order. Or create a road trip scavenger hunt by writing down a list of objects for your kids to race to find first. The winner gets to choose the lunch stop. You also can have an impromptu spelling or trivia competition. Other simple road trip games are easy to find with online searches or a fall-back to longtime favorites. Some include “I Spy” in which the first player says, “I spy with my little eye something … ” followed by clue to what is seen out the window. Another classic is the “Alphabet Game,” where each player tries to find something of each letter. On a trip to see national parks in Utah, Cook said she and her niece got through a list of all but two or three of the state license plates and Canadian provinces. She printed a checklist for that game off the internet. “If you Google road trip games, there is a lot out there, so you don’t have to reinvent the wheel,” she said. Their combined excitement over what they might see on a given day created dialogue. Have children take a photo of every animal or landmark they see on a printed list. Ask kids to research historic sites or landmarks for stops to break up the drive time. Foods such as Goldfish crackers and raisins pack well for vehicle travel. Don’t leave children or pets in the vehicle during the summer, even briefly. A roadside picnic or snack stop at a park can allow both kids and parents to stretch their legs. Wallace also suggests packing sunglasses for all in the family, even cartoon character eye protection for the youngest ones. And she’s a fan of packing spray-on sunscreen that eliminates the need to rub on lotion while kids are squirming to explore. If traveling in Washington state this summer, incorporate quick stops at some libraries, then post photos for a chance to win bookstore gift cards. The Washington Center for the Book is sponsoring the contest, A Passport to Washington Libraries, through Sept. 15. Post a creative photo to a crowd-sourced state map to show the range of public libraries in the state. In order to win prizes, participants must register at sos.wa.gov/q/register, then post photographs of a minimum of five Washington libraries to sos.wa.gov/q/passport with at least two of the library visits being 50 miles or more from the visitor’s hometown. Published: July 7, 2018, 5 a.m. Updated: July 10, 2018, 9:47 a.m.